Collaboration and connections – it’s what let’s wonderful things happen. The Quiet Hearts Ensemble is pleased to part of a great collaboration – Mark E. Sackett (The Art of Active Networking), Roger Killen (Vancouver Business Network) and the Quiet Hearts Ensemble. Since meeting Mark last year, I’ve been attending his networking events whenever he comes to Vancouver. These are rare opportunities as he spends most of his time in New York and San Francisco doing these events. Mark has been a fan of Quiet Hearts Ensemble and takes time to enjoy our weekly Music Oasis events whenever he is in town. Mark shared the idea of having his next Art of Active Networking meeting at St Andrew’s-Wesley so we could contribute some music during the event. I loved the idea, but came up against a wall. The church was already booked during the evening of November 10. Where else? I thought of Roger Killen. He hosts his own weekly Vancouver Business Network meetings at Pyatt Hall, a venue with a $240,000 Steinway Grand sitting on the stage. So I contacted Roger and connected him with Mark. Because Roger’s usual meeting fell on Remembrance Day, he did not have a meeting scheduled that week. He made a call to his Pyatt Hall contact and was able to book Pyatt Hall for November 10 in lieu of his regular Tuesday booking. Thank you Roger for making this possible. If you have been wanting to but unable to attend one of our weekly Music Oasis events at St. Andrew’s-Wesley United Church, we’ll be giving a special 20 minute performance at during Mark E. Sackett’s next Art of Active Networking event here in Vancouver. 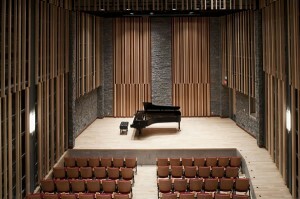 I’m salivating at the opportunity to create music on Pyatt Hall’s $240,000 concert grand Steinway. “Do you hate Networking as much as most of us do? Are you also bad at it, often wondering why no one returns your calls or follows up with you after a “Networking Event”? Join us for a very special edition of “The Art of Active Networking” in Vancouver, BC. The Vancouver Business Network Meetup (VBN) was founded in March 2010 and today is the largest community of active and aspiring small business owners in Canada. VBN holds inexpensive, high-quality seminars and networking events every week. These events help small business owners, entrepreneurs and marketing professionals learn, network and grow. They learn new tactics, tools and techniques. They network with like-minded people. They grow their networks, their businesses and their characters.